to guide me through the process of how to get the right shape of this cake, and then I had a whale of a time decorating it! The topper is a really rather cheap fabric flower which I picked up in a shop, and boy did I then struggle to fin feathers to add to the top! I wanted feathers large enough to decorate, and do the cake justice, so I had to settle for glue-guning several much smaller feathers onto a length of florists wire. When I bought the flower it was glitter free, so I decided to get out the glitter glue (like the child at heart that I am) and bedazzle it a little! substituting the gelatin for vege-gel (as I am vegetarian) and added some purple colour paste to one half of the fondant and added black food dye to the other half, as well as a large amount more icing sugar when the liquid made it far too sticky! 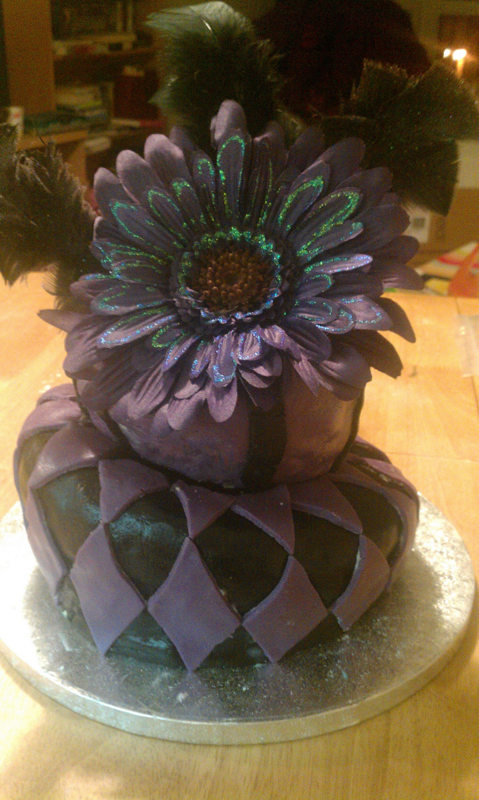 It was my friends birthday, and she loves purple and black, and therefore I think she rather liked her cake! I can't wait to get baking some more and experimenting more with the fondant icing! As they say, practice makes perfect! Bye, bye for now from this baker.